...as an active quad line kite flyer I, Roelof van der Tak, endorse this LaserPro trademark statement from experience. Other strengths in consultation. The sets are being made in The Netherlands and delivered Ready To Fly (RTF) on a LaserPro winder. Bulk spools available in 300 yards (274,3 meters) or 1000 yards (914,4 meters). At Vliegertak Kite Lines you can also order other supplies like: LaserPro winders, sleeve needles, line equalizers (see Product Gallery). Actual price, a question or advice please feel free to contact. The lines are imported from the USA. Due to the high fluctuation of the US dollar to euro exchange rate it is impossible to specify prices on the website. Experienced the bad luck of breaking a single line? Upon request Vliegertak Kite Lines will supply you with a single line. Innovative Textiles provides you with a warranty against defects in manufacturing for a period of 1 year from date of purchase. 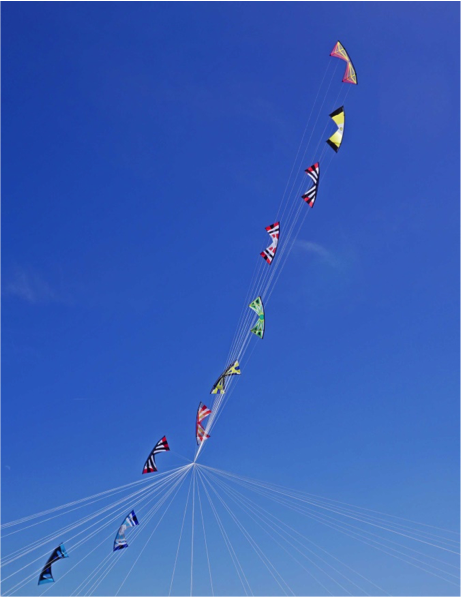 With approval of Innovative Textiles the warranty is fully supported and taken over by Vliegertak Kite Lines. In case of a line failure please contact me, the line will be replaced immediately. Ordinary wear and tear and accidents in flight are excluded from this warranty.